Plant Easter lilies outside when the last bloom has faded on the planted pot. The planting process is not difficult. 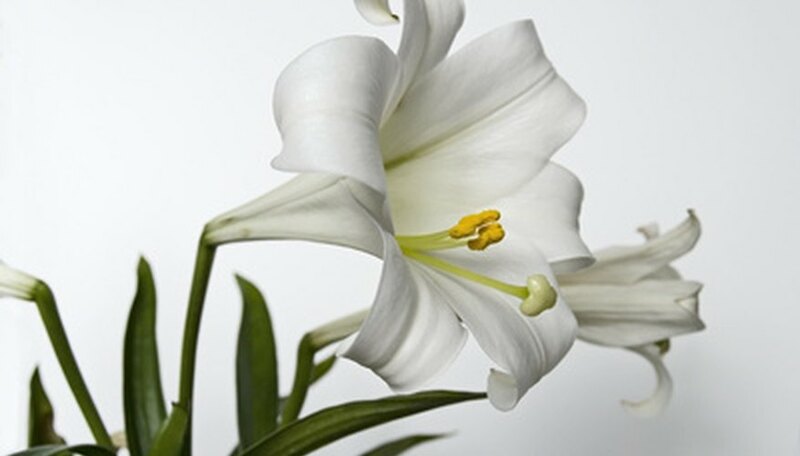 Follow basic gardening guidelines to resurrect the beauty and grace of your Easter lily for several years. Easter lily bulbs are hardy and most lilies that are planted outside will grow and produce full fragrant flowers next season. In some instances, a second flowering will occur in the same season that the bulb was planted outside. Deadhead or pinch off dead blooms and allow the lily plant to wither as the season ends. Place the potted lily plant in a sunny location indoors. Water the plant frequently enough to make certain the soil does not become dry when probed with your finger to a depth of 1 inch. Add 1 tsp. of a slow-release, general-purpose 15-9-12 fertilizer once every six weeks. Prepare a garden in a location that receives at least six hours of direct sunshine each day and is well-drained. Mix one part peat, one part perlite and one part sandy or loam soil in the planting area. To ensure proper drainage, raise the garden bed to a height of at least 6 inches above the rest of the garden and wall it in with a border of cinder blocks or other material. Mulch the bed with 2 inches of organic mulch such as compost or tree bark. Dig a hole 6 inches deep, measured from the top of the mulch, and wide enough so the root system can be spread out naturally with plenty of room for the soil to be worked in around it, leaving no air pockets. Plant the bulbs 6 to 12 inches apart and water the plants immediately after planting. Maintain a 4-inch layer of mulch made of compost or tree bark throughout the winter. Remove enough of the mulch as necessary to apply a slow-release, general-purpose fertilizer in the spring by applying the fertilizer to the soil around each plant 2 inches from the stem. After fertilizing, replace the mulch but leave enough room for new shoots to emerge in mid-spring. A living mulch of shallow-rooted annuals or perennials provides good ground cover and forms a living mulch. Maintain at least 2 inches of mulch around the base of the stem because lilies prefer the top of the plant in sunlight and the bottom of the plant in shade. Easter lilies do best when kept moist but not over-watered to the point the roots stay wet. Over-watering causes root rot and results in poor flowering and possibly death.